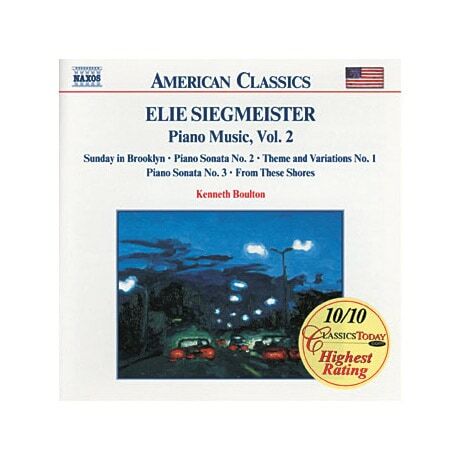 The works of Elie Siegmeister (190991) are grounded in deep emotion and expressive musical language. A student of Nadia Boulanger in the late 1920s, Siegmeister addressed specifically American themes during his long and varied career. His 1985 suite These Shores portrays five writers (Walt Whitman, Mark Twain, Henry David Thoreau, Langston Hughes, and William Faulkner), while his single-movement Piano Sonata no. 2 (1964) uses tonal effects unique to all his solo piano music, including hammered notes, tone-clusters, plucked strings, and harmonics. This collection also includes his 1932 Theme & Variations and his Third Sonata of 1979.